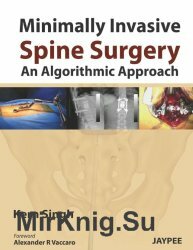 This book Minimally Invasive Spine Surgery: An Algorithmic Approach is organized in a logical fashion with an introduction, clinical evaluation, intraoperative positioning, surgical techniques, potential pitfalls and pearls of treatment and discussion. This book has written extremely well-known surgeons who are experts in their respective fields of minimally invasive surgery. This textbook attempts to formally describe a simple to understand decision-making process that is the essence of minimally invasive surgery. The chapters of this book are organized in a very technique-focused text that provides intraoperative pearls, pitfalls and technical descriptions. The reader can quickly review the decision-making algorithm at the beginning of each chapter and read the text for a more detailed description of the decision-making surgical process. Readers will enjoy a high-level sophistication with the text. The remainder of the chapter is devoted to the surgical pearls that are rarely mentioned in other surgical textbooks. All aspects of minimally invasive spine surgery are covered especially special topics including Tumor, Trauma and Deformity. Routine procedures are covered in detail with particular emphasis given to surgical nuances and pearls learned from experienced MIS spine surgeons. All levels of experience will truly appreciate the detail, clarity and sophistication associated with this comprehensive MIS Spine Surgery algorithmic textbook. Make this book well-suited for medical students, residents, fellows, and surgeons who not only want to be introduced to a new method of surgical management but also to refresh an experienced surgeon on a particular surgical technique.